So, basically this gift guide is exactly what I want for Christmas. Let’s hope this post makes its way to my husband hehe! I tried to include items at every price point. I also broke it up into the different sections so hopefully there is something on here to excite every mom! 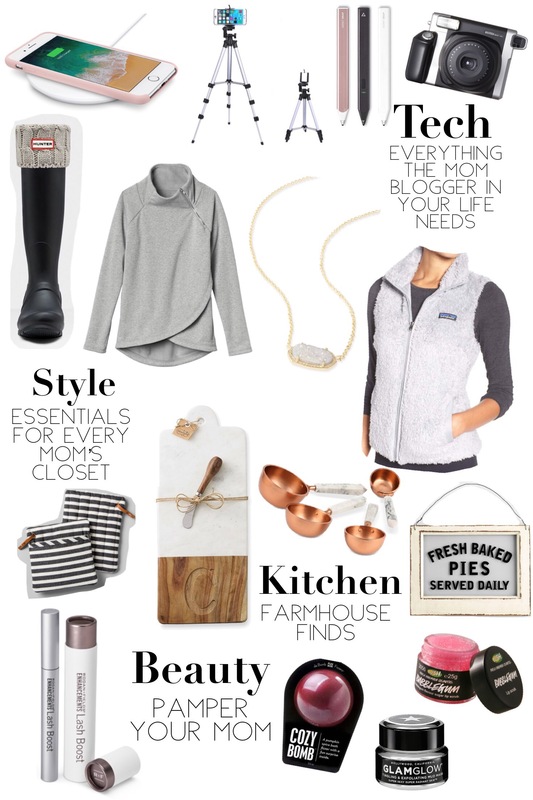 The first section of gifts is for the mom bloggers out there. Since, I am pretty new to this I am lacking in many of the essentials. I definitely want to invest in a tripod to capture those photos even when Dad’s not home. 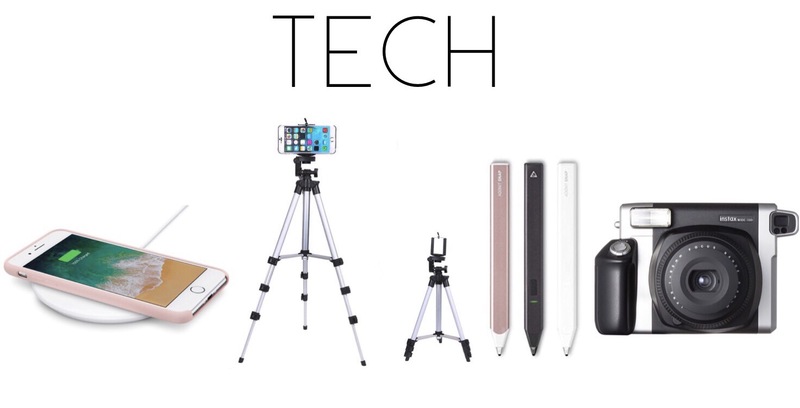 The stylus pictured is perfectly paired with the tripod because it allows you to take photos remotely with your cell phone. I love the idea of having a wireless charger in my kitchen. Currently, my only phone charger is in my bedroom and it would be nice to have one to set the phone on periodically throughout the day. Because, let’s face it, if you’re a mom blogger you spend way too much time on your phone. The instant camera has been on my wish list for a little while now. It brings back the days of my childhood when I used to snap photos with my mini Polaroid camera. The Hunter boot socks are amazing and keep my feet so warm. Here in Ohio they are a must have. If you make the investment of Hunter boots you want to be able to wear them even on the cold winter days and these socks make that possible. 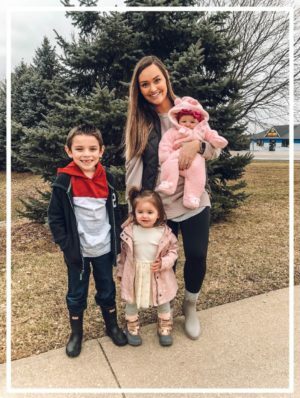 One of my favorite mom bloggers Lynzyandco shared this top and as a nursing mama I NEED this. So, it definitely made its way onto my wishlist. I also love wearing vests. I swear we can wear them about 75% of the year in Ohio, so you can never have too many. Also, what person doesn’t love getting something glittery on Christmas!? 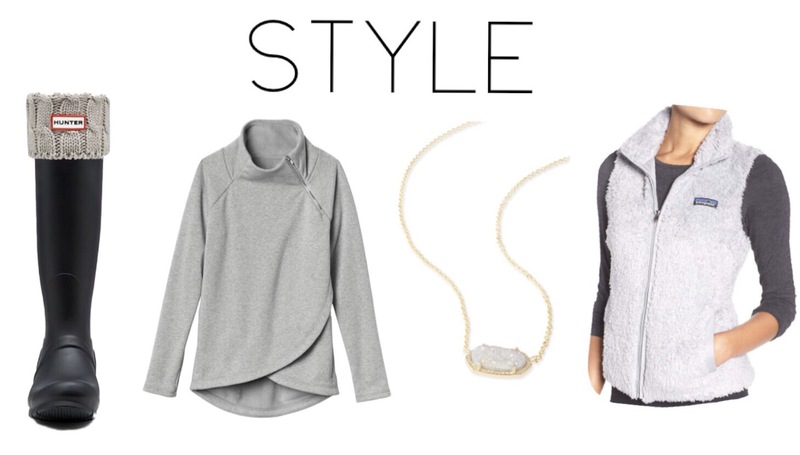 That’s why this Kendra Scott necklace is perfect. It is simple but unique and Mom will definitely love it. I linked up a few extra cutting boards because I think it makes the perfect gift. I can never have too many and they are great for hosting. I love the mixture between marble and wood. You could also add some meat, cheese and crackers with this and make it into a little basket. The pot holders are from Chip and Joanna’s line so you cannot go wrong with them. 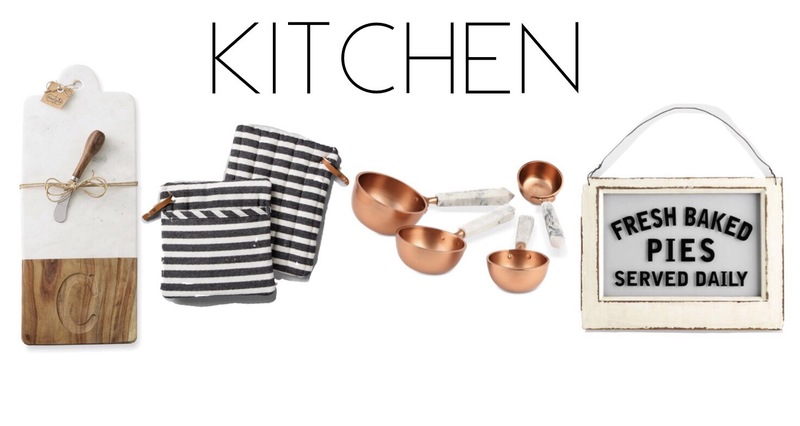 The copper and marble measuring spoons would make a great little stocking stuffer. You could pair it with a pre-mixed baking kit. Lastly, I think this little sign is so cute. It is a classic piece for any farmhouse kitchen. 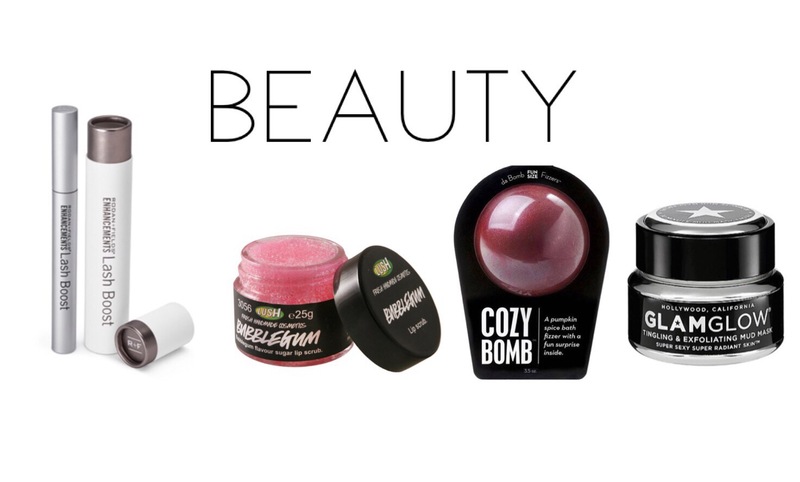 Every mom deserves to feel beautiful and I think these products do the trick. I have been using lash boost for a few months now and my lashes are so much longer and fuller. I have always wanted longer lashes and I finally have them. But, I’m almost out so I need a refill. Bath bombs are a great way to give Mom a break. Every mom could use a little more quiet time. The lip scrub is another fun stocking stuffer. The Glam Glow Mud Mask is my absolute favorite mask. Every time I use it I feel like my skin is brighter and tighter. It really is a facial in a jar. 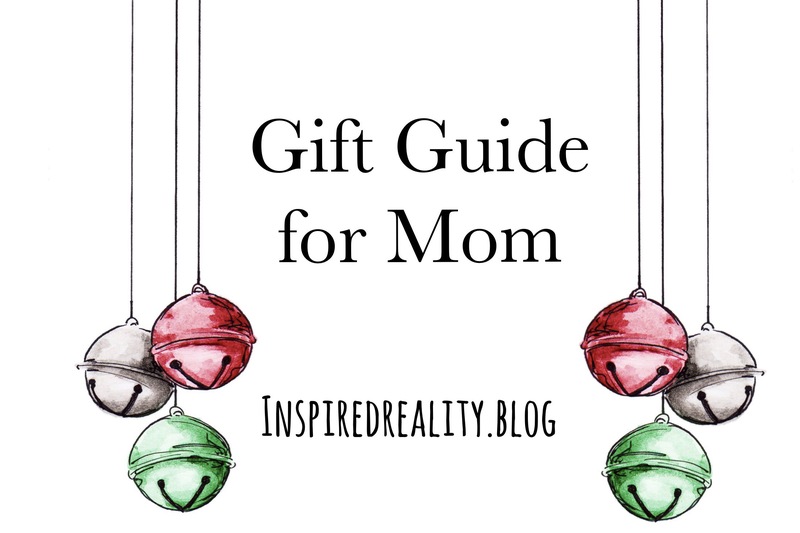 Hope this gift guide makes your holiday shopping a little smoother and pleases the mom in your life! Next Post Pom Pom Everything! Hi Tina, there are some fabulous items in your wishlist here! I’m sure your husband can accidentally find this list hehe. I would love iPhone charging pad mine right now is a plug-in. To boot socks do look warm, and I like to pull over and vest. Great picks too in the kitchen, copper items seem to be everywhere now, I love the sign, I just don’t know if it will be true in my house! We all like Fuller lashes, I need to try this product, and if I ever get alone time I will try the bath bomb! Looking forward to following you Tina, hugs Terri xo. I have a mophie battery case for my iPhone 7 purchased through Amazon (currently $69.99) that charges wirelessly via an Anker fast wireless charger ($25.99 on Amazon). You could put those in many rooms at that price!